Ever since its release in 2002, the film Minority Report has been used as a sort of yardstick by which all super-futuristic technology is measured. In the past few years especially, the glimpse into the future it offered has become increasingly more imminent. Of course, not in every way—as far as I know there are no sentient albinos floating around in a pool pre-cognitively preventing all crime before it happens. The Purge now seems a more realistic vision of the future in that respect. But as far as the technology it predicted, we truly seem on the cusp of living in that world. At the front of the meeting room is a triptych of screens, and then off to the side reside a series of what the company calls "cork boards"—screens where you essentially park information while the screens in front remain more fluid. Or maybe we're already living in it. Tomorrow at InfoComm, attendees will get a chance to meet Oblong Industries and its product Mezzanine. Oblong was founded in 2006 and its CEO is none other than John Underkoffler, the man who acted as science and technology advisor on Minority Report. Steven Spielberg grabbed him out of MIT, brought him out to LA, and allowed him to bring his vision of the way we might one day interact with technology to the big screen. As the company says, today it sells commercial versions of the Minority Report computers. Absorb that sentence for a moment. Imagine what it might look like and mean. Imagine the way it might impact the way we live, work, communicate, and collaborate. When I spoke with Mike Brown, Oblong's global VP of sales, and Gene Kim, head of global marketing, they could barely contain their excitement for the world to meet Mezzanine at InfoComm. They expect it to be one of the key hits of the show, and its hard to imagine they're wrong. Before I get into the uses of Mezzanine, I'll do my best to describe what the standard setup might look like. 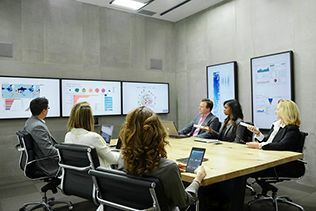 At the front of the meeting room is a triptych of screens, and then off to the side reside a series of what the company calls "cork boards"—screens where you essentially park information while the screens in front remain more fluid. This setup, however, is very flexible, and the number of screens can increase or decrease as desired. Users then use a remote tracking wand to move information from screen to screen, device to screen, etc. These movements can also be performed by smartphone or tablet. According to Brown, Mezzanine not only brings boardrooms to life, it turns them into a multi-faceted, elastic, virtual rooms. It offers a new way of working, and a new way of engaging current and potential customers. It enables collaboration in the room and across rooms through a term they've coined—infopresence. This turns telepresence on its head by introducing the ability to mirror screens remotely in realtime during a conference. Data, slides, images, videos—you name it. The conceivable uses for this kind of product are endless. Multiple experts can be connected remotely for business-based education. Collaboration and creativity can basically be put on steroids. Simply brainstorming with co-workers goes to 11. If you haven't gotten the message yet, this is an InfoComm must-see. The company has a 20x30 booth space right next to Microsoft. It will be presenting three actual interactive environments for attendees to experience—a mini command center, a main conference room set, and an abbreviated mini-conference room. Through these three environments, the company plans to demonstrate what infopresence is all about. On the company's website, a quote from Beats Music CEO Ian Rogers—a Mezzanine early adopter—is featured. It says: "When someone comes to your office to learn your vision of the future, it's crucial they feel like they've walked into the future, not the past."